The 2017 KTM 390 Duke raised the A2 licence bar. It’s one of the most fun to ride, involving and high quality machines in its class. It’s refined, easy to live with, fast, comes with a high level of spec and superb attention to detail. There’s a whole raft of official ‘Power Parts accessories, too’. If you plan for this to be your first ‘big’ bike you’re in for a treat, but even if you’re an old hand it won’t fail to impress. 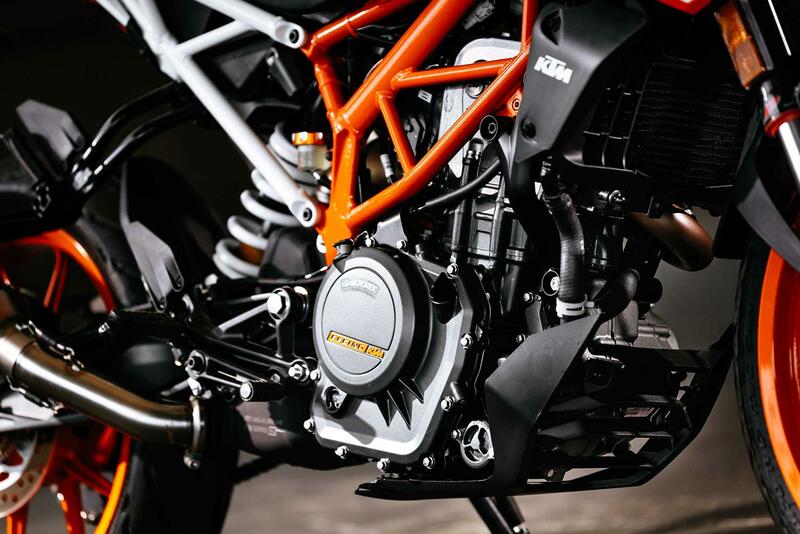 KTM completely transformed the 390 Duke for 2017, turning it from merely a good low-capacity naked, to the best machine in the entire A2 licence category. Giving the bike its first major updates since its inception in 2013, the 2017 version offers an unparalleled level of fun, quality and performance for its size. Gone is the slightly lack lustre quality and styling and in its wake comes a 5.2in full colour dash, illuminated switchgear, brilliant panel fitment and deep glossy paint. Claimed dry weight is just 149kg dry, meaning its 44bhp single-cylinder engine has more than enough poke to achieve a decent level of performance. Despite its new-rider-friendly ergonomics, the 390 is serious fun. 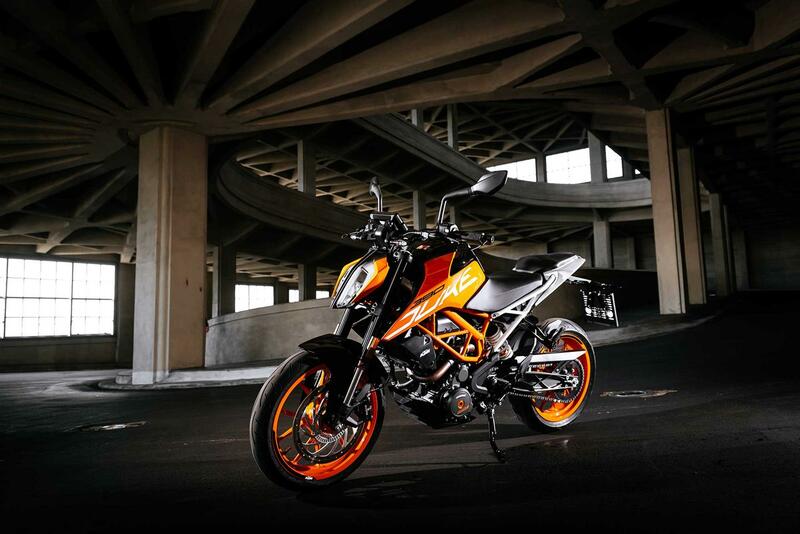 It’s capable of a genuine 100mph, you can tempt the Duke into the occasional wheelie and it will back into corners when the ABS is switched to Supermoto mode. 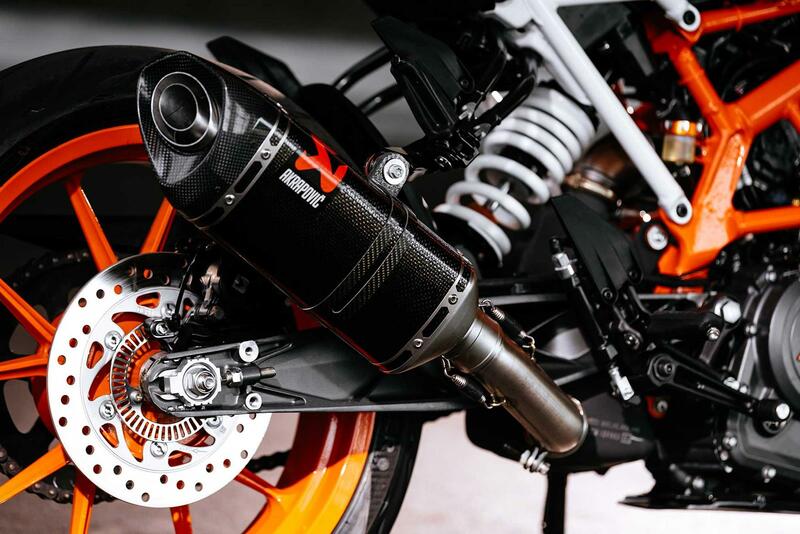 To comply with the new stringent Euro4 emission laws, KTM have given this bike a ride-by-wire throttle and a bigger airbox. A side-mounted exhaust also replaces the old stubby underslung unit. This year’s bike keeps its slipper clutch, which was added in 2015, and a new chassis also gives the 390 its sharp handling. If you fancy an A2-friendly naked but the KTM isn't your cup of tea, you should consider the Honda CB300R, Kawasaki Z300, BMW G310R or Benelli BN302. As well as a smoother power delivery and more grunt, the new 390 also has sharper handling and more precise steering thanks to a new chassis. The steel trellis frame, which now has a bolt-on subframe and a 690 look-a-like lattice swingarm, has racier geometry and a slightly more canted-forward riding position that shifts more weight on to the front end. As a result, there’s extra feel for what the front end is doing in the corners, but the KTM is still roomy, comfortable and with its straight bars, still has an aggressive, supermoto feel to it. Adding to the sense of big-bike quality is the new WP 43mm upside down forks and single rear shock. KTM reckon they’ve spent a lot of time developing these units for the new machine and you can tell. Braking is also improved with the old model’s four-piston radial Bybre (a subsidiary of Brembo) caliper now gnawing a single disc that’s grown from 300 to 320mm. To keep up with Euro 4 regs, the 390 Duke’s four-valve 44bhp, 373.2cc single-cylinder motor now has ride-by-wire, a side-mount exhaust, replacing the old stubby underslung item and a bigger airbox. KTM says it makes 5.7% more torque at low rpm. You also get a slipper clutch (added to the 390 in 2015). It might be small, but the engine is smooth, punchy and there isn’t much it can’t do in the real world, especially with just 149kg (dry) to push along. It has performance to keep you interested long after you’ve jumped through the hoops needed to get your full licence. Only time will tell if the new 390 Duke will be more durable than the original, which suffered some reliability and quality issues. The new machine’s build quality, paint finish and level of components is much improved, so the signs are good. With a vast improvement in build quality, more expensive-feeling components and lots of snazzy standard equipment, the 390 Duke offers the best value for money in the A2 licence class. A new one will set you back £4699, and used examples are already coming onto the market at a little under £4000. Find a KTM 390 Duke for sale or search all KTM Duke bikes. 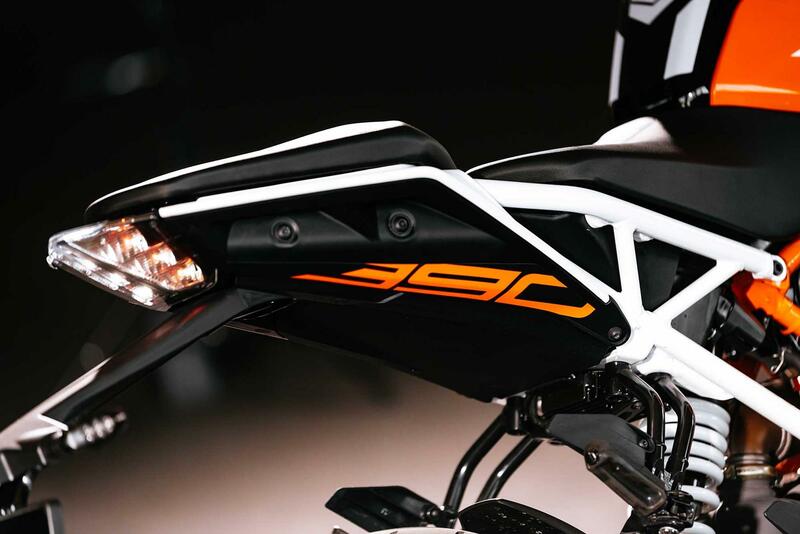 It’s the 390’s first major overhaul since its launch in 2013 and KTM have left no stone unturned. 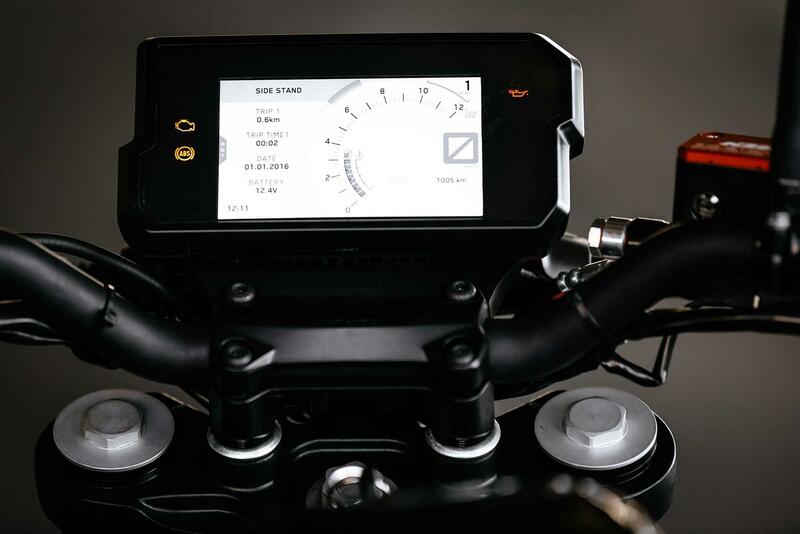 As well as new styling the fuel tank capacity is up from 11 to 13.4-litres and there’s a new two-piece seat, handlebars, adjustable levers, riding modes, ABS and a new 1290 Super Duke R-style LED headlight. Front brake 320mm disc with Bybre four-piston radial caliper. Rear brake 220mm single disc with single-piston caliper. 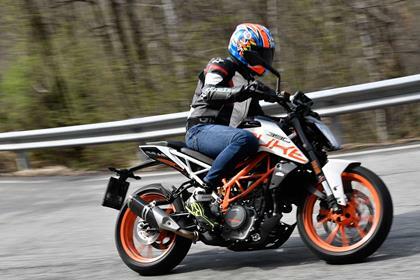 KTM first launched the 390 Duke in 2013. 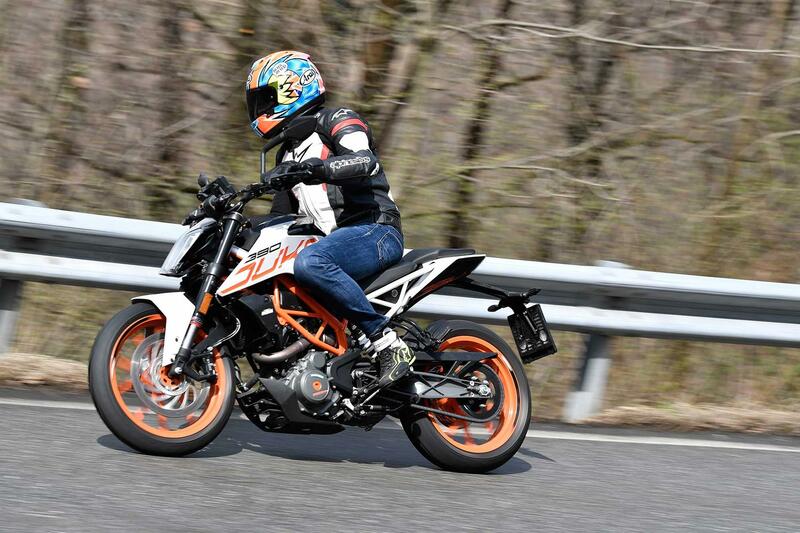 The 373cc single-cylinder A2-licence-friendly machine is an overnight success for KTM. 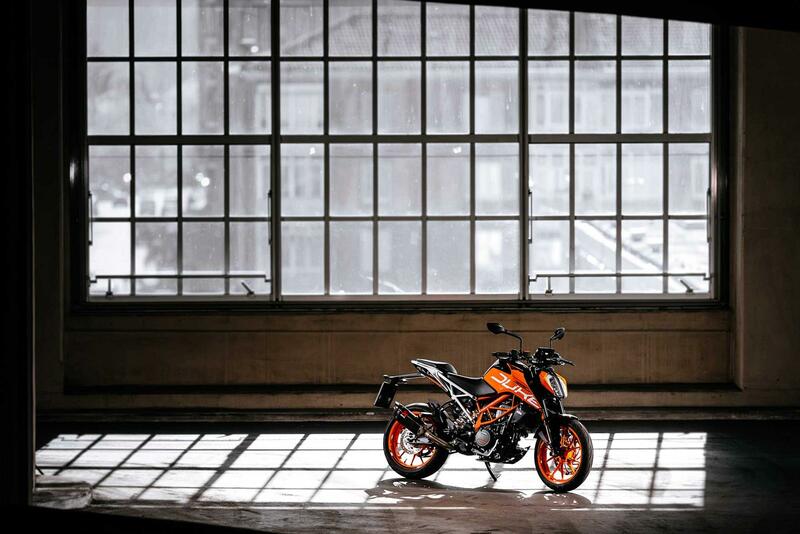 The KTM 390 Duke is part of a range of machines to cater for riders of all levels and licences. The KTM 125 Duke is the learner legal version, but still has a big bike feel. Above the 390 you find the KTM 690 Duke, a fully-grown version with 72.5bhp but the same lightness and flickability as the others. No owners have yet reviewed the KTM 390 DUKE (2017-on).